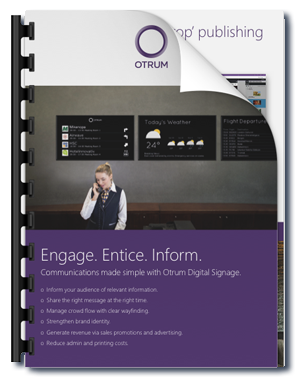 Otrum focuses on the core software platform needed to operate hosted digital signage solutions. Via our technology partners, we enable you to show your information on a variety of digital signage displays with commercial grade LED LCD screens. Indoor totems are eye-catching and can be custom ordered in any RAL colour, as well as being branded with your logo. Totems come in a variety of sizes, the images below are for example purposes only. Outdoor totems are increasingly popular, with a temperature range suitable to survive freezing Scandinavian winters as well as hot Middle Eastern summers. With built in heating and air-conditioning, outdoor totems are sealed from the outdoor environment. (also available in RAL colours). Totems come in a variety of sizes, the images below are for example purposes only. Download our brochure, or contact us for more information or to arrange a free demonstration.